Designed by Jason C. Hill. Published by Flying Frog Productions. Released in 2014. 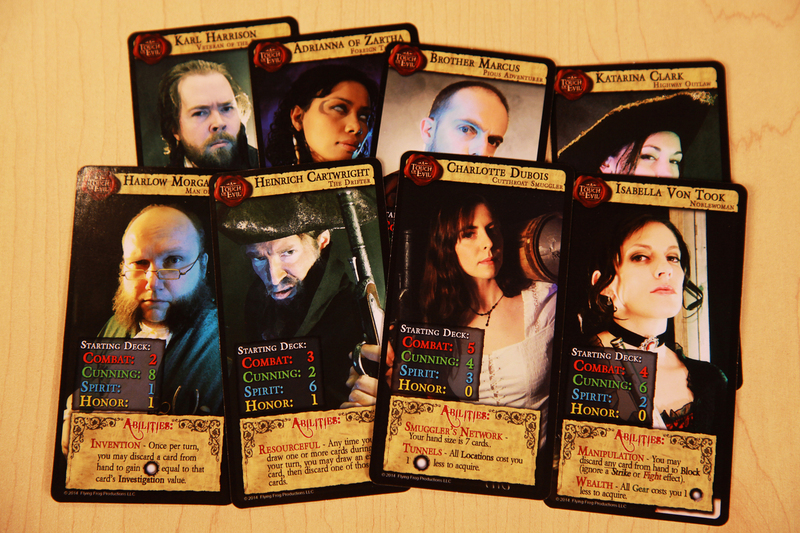 For 2-6 Players ages 12+. Plays in 60 minutes. A review copy was provided by Flying Frog Productions. 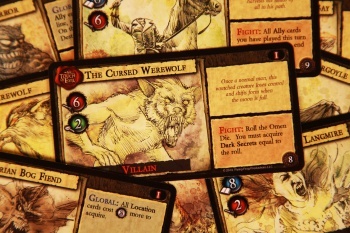 If you've ever played a deck-building game like Dominion or the more recent Ascension: Chronicle of the Godslayer and its expansions, you'll have no problem picking up the mechanics of Dark Gothic, and regardless of your experience with the game's genre, you'll be instantly familiar with the camp horror aesthetic. 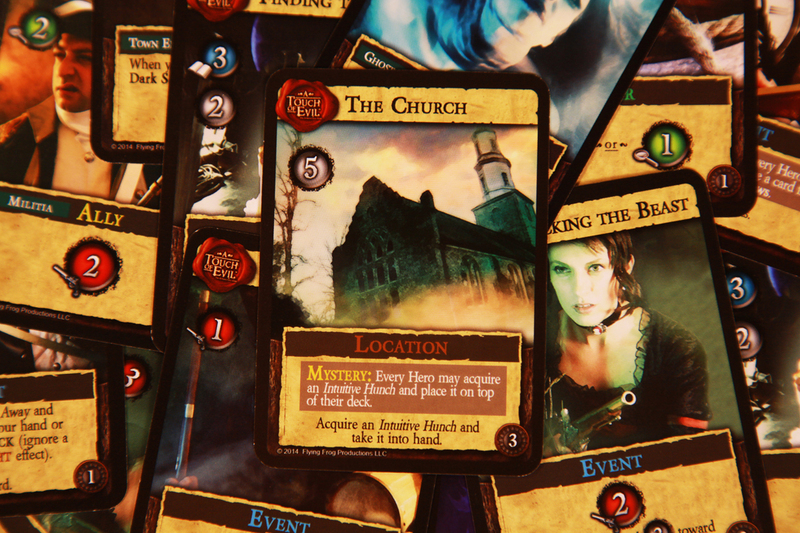 Despite vast similarities between Dark Gothic and Ascension, there are several notable differences that make the experience unique and, at least in some cases, even more fun. Every turn, you'll draw six cards from your deck (anytime you run out of cards to draw, simply shuffle your discard pile and it becomes your deck) and play them to take cards from the Center Line (Minions, Gear, Locations, and Events); acquire "Training" cards, which are always available to purchase; fight the Common Minion to remove Starter cards from your deck; or fight the face-up Villain card, which is the mutual enemy of all players. 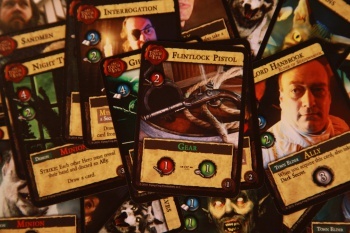 The first two options help build out your deck, with every available card being an improvement from Starter cards, the third helps thin your deck, removing lower-power cards, and defeating the Villains is how you'll eventually end the game. 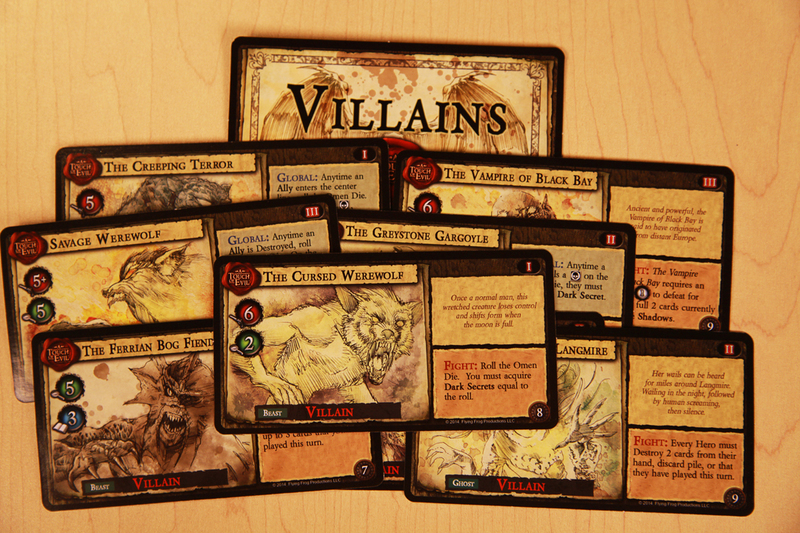 Once the players have defeated the final Villain, everybody adds up the value of the cards in their decks, and the player with the most "Investigation" - a resource on every card except Starter cards, as well as on the Villains you defeat - wins the game. Playing cards for resources is at the very heart of deck building games. In Dark Gothic, there are three colors, with Red representing Combat, Green representing Cunning, and Blue representing Spirit. Additionally, you can gain colorless resources, which can be redeemed for any of the three main colors. It's important to note, however, that when a card costs X colorless, you have to pay all of X with the same color. When starting the game, only the "Honor" card creates a colorless resource, also allowing you to draw a card, making it easily the most powerful card in most starting decks. 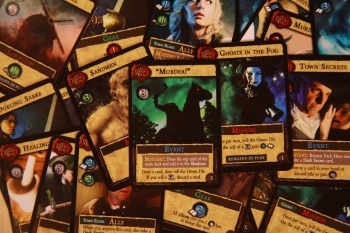 All starting decks are not created equal, however, as each of the game's heroes has a different composition, making for more varied early game strategies, and vastly changing how each game plays out. Knowing the other players' strengths and weaknesses not only makes the game more interesting early on, but allows some devious lines of play that aren't available with shared deck composition. 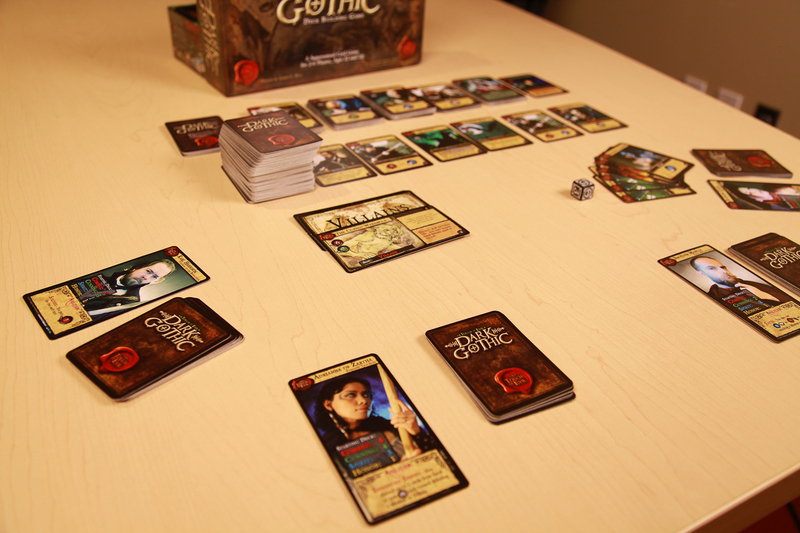 One of the game's big features are the Hero and Villain cards, which represent either a player character or a monster that must be defeated to win the game. There are eight total Heroes to choose from, neatly divided between male and female characters, and a total of nine different Villains, with three from each "rank" of general difficulty. 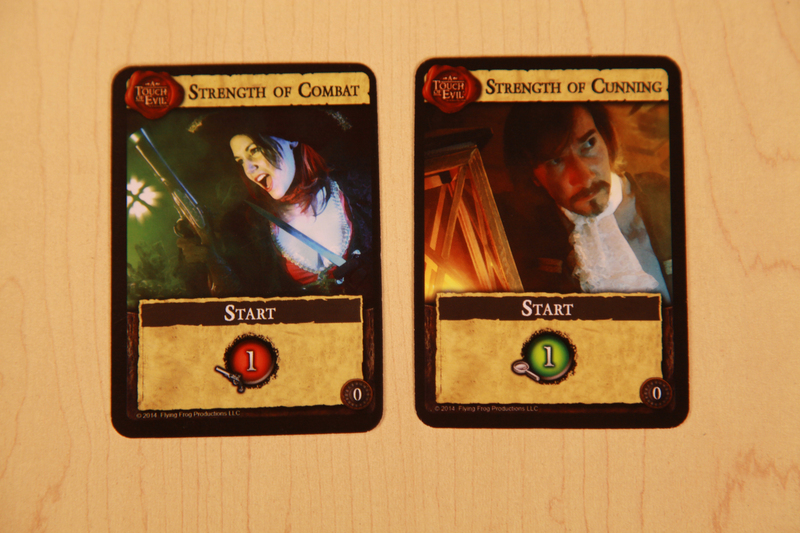 Each of the heroes - from the learned Man of Science to the ruthless Cutthroat Smuggler - will have a special ability, in addition to the customized starter deck. The balance on the abilities doesn't seem quite right, however. Charlotte Dubois' "Smuggler's Network," which gives you +1 to hand size, and Heinrich Cartwright's "Resourceful," which lets you draw an additional card every time you draw, then pick one to discard, both seem to be favored to the others, although that power isn't so overbearing that it dictates every game. 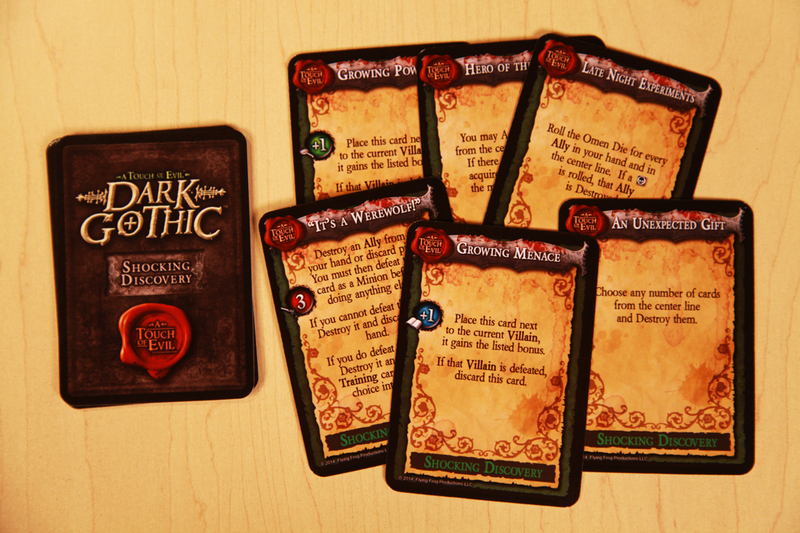 Unlike Ascension, which basically has all players collecting from a limited pool of victory points, Dark Gothic only ends when all three monsters - one from each difficulty rank - are defeated by the players. 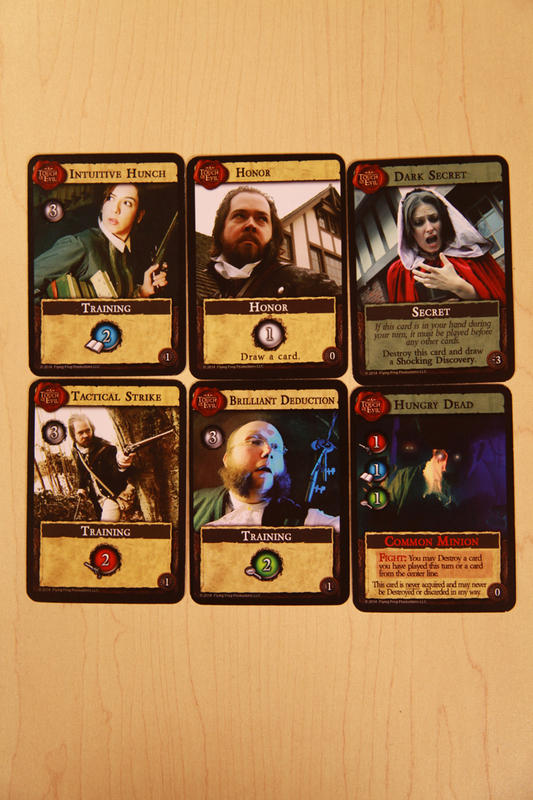 Alternately, the Villains can actually win if the players don't keep "The Shadows" from overwhelming the countryside, which is represented by certain mechanics putting face-down cards into "The Shadows," until 10 are collected, and everybody loses. It's refreshing to have a game that can actually end in disaster for everybody, if people are unwilling to cooperate . 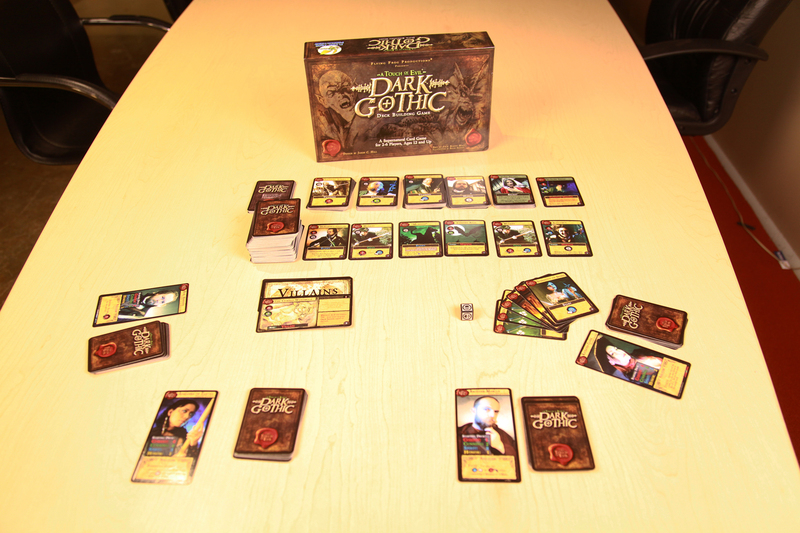 The Center Line in Dark Gothic is where the dynamism of the game originates, with a number of different card types, each having unique interactions with the game state. When you acquire a Minion, frequently you'll have to contend with its "Fight" mechanic, which can range from beneficial to nigh-devastating. Harpy's fight allows you to destroy a card in your discard pile, which is great if you're trying to thin your deck out. Timber Wolves, on the other hand, require an extra Combat for each Ally you've played during the turn. Mysteries occur frequently when the Center Line cards are replaced, with immediate impact that can speed up the game's clock or slow down the next turn; "Each Hero must discard a card from hand," and "Roll the Omen Die [d6 where two sides are skulls] and add that many cards from the top of the main deck to the Shadows." Then there are Dark Secrets. 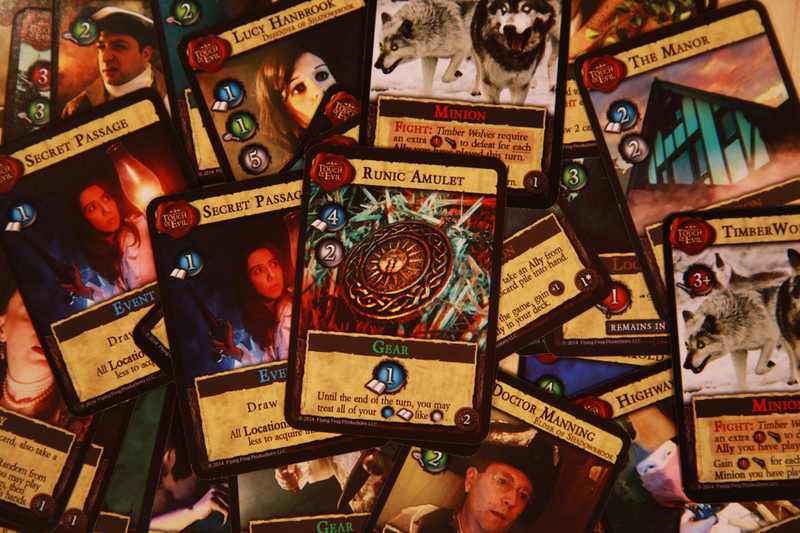 Dark Secrets are most often acquired by picking up a powerful Ally card from the Center Line. There are some Mysteries that require each player to obtain one, however, which can be particularly nasty in a several-player game. When you draw a Dark Secret, you must play it first on your next turn, drawing a Shocking Discovery card. Some Shocking Discoveries give a minor buff to the active Villain, and others are incredibly painful like "Late Night Experiments" which forces you to roll the Omen Die for each Ally in your hand, and destroy those you rolled a skull for. 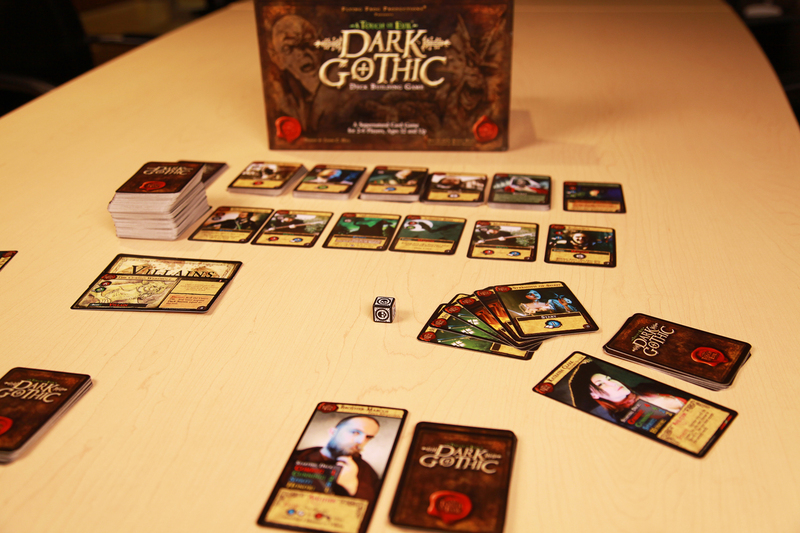 The aesthetic aside, Dark Gothic is ever so slightly more complicated than introductory Deck Building Games I've tried out, lending a bit more replay value without having to invest in expansions or the like. Play times can vary immensely, depending on the cards that come up, ranging anywhere from 15 to 45 minutes, well under the box's suggested 60 minutes. 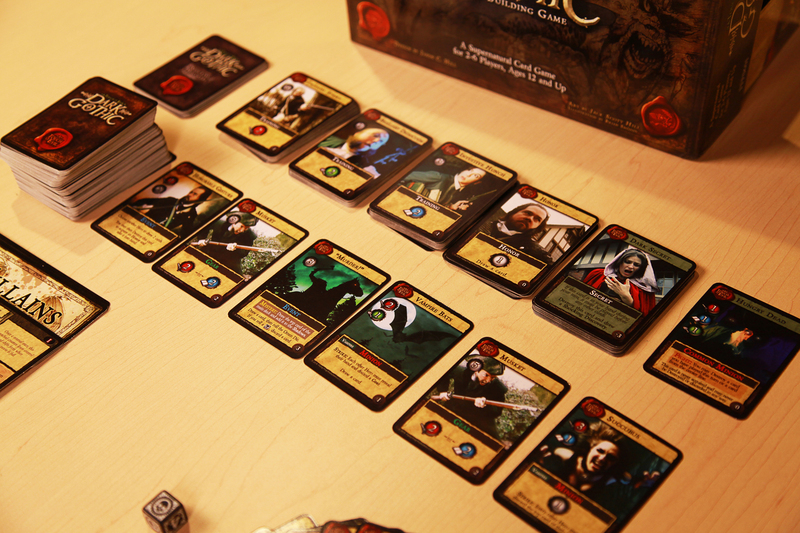 Setup can be a little time consuming, depending on how much time you dedicated to break down the last time you played, since 90% of the cards have the same back, but they must be separated before you can start playing. It's fun, well designed, and the nostalgic motif, reminiscent of the classic Nosferatu, makes for a great experience, marred only by a few imbalances which will be immediately obvious to advanced gamers . 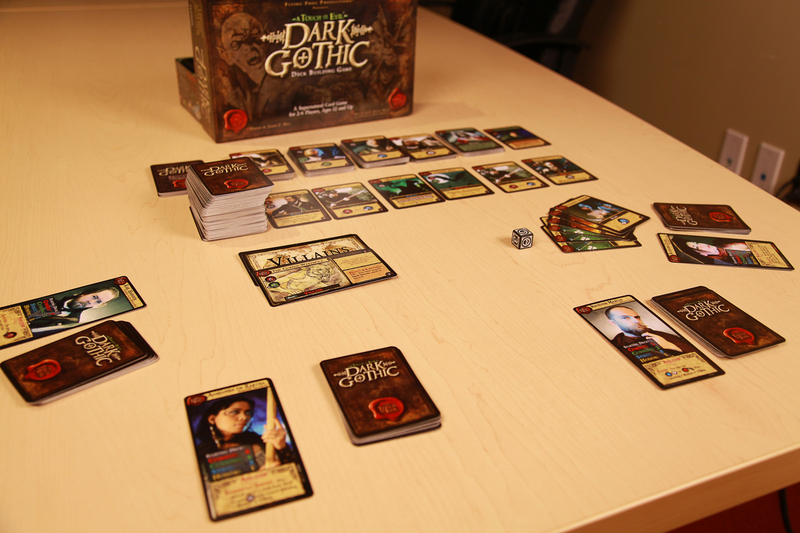 Bottom Line: Despite being slightly more complex than some others in the genre, Dark Gothic is still very much an entry-level board game. Fortune and Glory this is not. While there is some advanced strategy to be had, it's accessible to virtually anybody that doesn't mind doing a bit of reading. Recommendation: Being accessible is both its greatest flaw and most powerful merit. It'll never be the go-to game for advanced players, but it'll always be an option regardless of player experience or skill levels. If you have a lot of non-gaming friends that you want to introduce to the dark side of tabletop, this is a great place to start.